My beauty regime is pretty pathetic - I have a bathroom full of lotions and potions, promises and dreams, that get forgotten in a world of being late for something ALL the time. I can just about remember to moisturise but cleansing and toning - hmmmmm, what? But my hair, that's a different story. There is no way I could do the same with my hair - It's just not that manageable. I've spent my adult life going from long to short, fringe to no fringe, blonde to brunette in an attempt to make it do what I want. At the moment I am 18 months into growing out a graduated bob that was conceived after a sick day watching too much 90210. I loved it for a couple of years, but then I missed my long hair. I wanted beachy waves and fishtail braids, but my hair has never done the perfect beachy wave, even when it's been dried full of salt from the sea and now my hair is almost long enough to fishtail, they are so 2012! Give me 6 months and I'll want another change although I've promised myself no fringes, no matter how sweeping it is, until winter. But long or short it's far too thick and naturally left, it sits somewhere between frizzy and wavey - without mounds of products or wrangling with the straighteners I really shouldn't leave the house. So when the people at Brit Bloggers got in touch to offer me some GHD styling products to review I jumped at the chance. I've been a huge fan of GHD's since my uni housemate came back after Christmas with some in 2002, they might not be the most hard wearing of straighteners (I'm on pair 4 and I've currently got to wrap the cord tightly round my fingers to stop their random crazy beep beep, beep beep, beep beeps) but I haven't found anything else that tames the beast that is my hair so well! And when my package arrived I was suitably impressed. 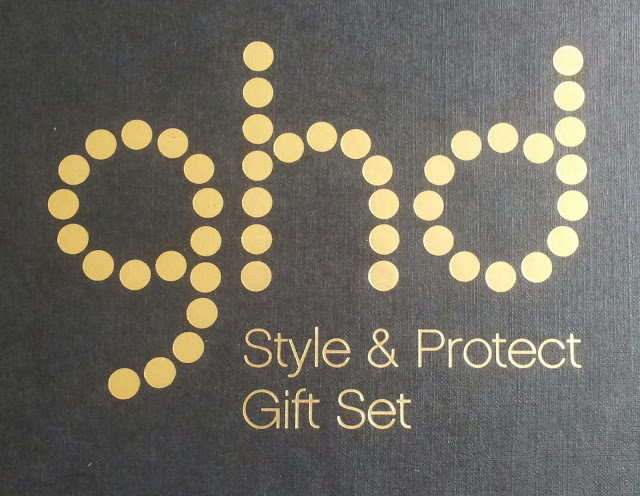 They sent me the Style and Protect Gift Set, which is worth £39. You know I am a sucker for packaging, so the nicely textured box, with the gold logo, makes me happy and is a great place to store all my hair products too, as Flash loves trotting round the house with any bottles or tubes I haven't put out of reach of his little puppy jaws! Inside the box I received a paddle brush, 2 sectioning clips and a Straight and Smooth Styling Spray and a Final Shine Spray. When I cut all my hair off I got rid of my old paddle brush (it was ready to be replaced and it just too big for the shortness) and as my hair grew I never replaced it. I honestly had forgotten how much better I can use a paddle brush when I'm straightening (and how good they are at cutting through the tangles my hair inexplicably creates when I sleep). I've never used a heat styling spray before, well, I did once, but it made my hair crackle and steam so I didn't try it again. I've used this on my wet hair before drying, and also during the straightening process. Even though it is a wet spray, it doesn't seem to soak my dry hair so there is no fizzing or cracling as if my hair is burning when straightening, which I am guessing can only be a good thing. And it smells lovely too which means I've been using in between washing too. I'm not sure if it's the fact I'm using a more suitable brush, or the spray, but my hair is certainly less frizzy when straightening. What I really wanted to show you were some perfectly done, loose curls at the bottom of my hair, but I don't have the skill for that right now, not with straighteners anyway (one of the girls at my WI manages it and she tells me she has a curling wand that creates them - I think that'll be next on my hair wish list) So for now, I've pulled together a pin board of my favourite summery, festivally, hairstyles - I have a good few weeks to try and perfect at least one of these (or find out if the other ladies in the group can try them) so that I look good on one day at Glastonbury. What I want to know now is, what is your favourite summer hair? And importantly, can you come and show me how to do it? Disclaimer - I wasn't paid for this post, but I was given the product.